This variation on Escher's lithograph "High and Low" was created by 3D-artist Robert Stein III in 1994. 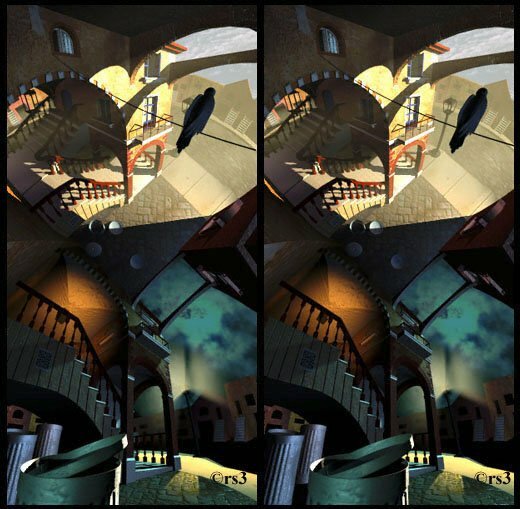 Unlike other variations of the lithograph this is a stereo image of the Escher's scene. 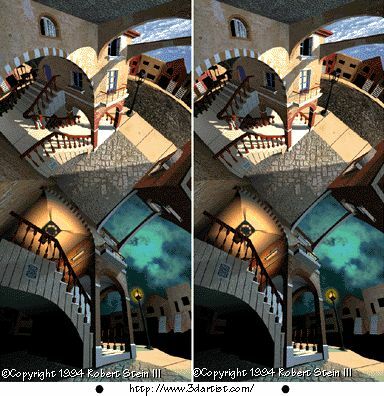 The artist named the artwork "Day and Night", because except Escher's perspective illusion he shown day at the top of the artwork and night at the bottom. The image was found at http://www.3dartist.com/3dao/s/16/srescher.htm. Robert Stein has a classical art education and was widely published (remember those Banana Republic catalogs?) before ever meeting a computer. He went from the Aurora 125 in 1986 to early Amigas, and then to 3D Studio in 1991. He was a lead artist for Trilobyte on Virgin Interactive's 7th Guest and XIth Hour games.